2019 marks the 24th year for this popular monthly film program which celebrates the best of cinema with a curated selection of extraordinary films from Canada and around the world. This pass is good for the 12 individual films in the series, from the time of purchase. These are screened in cinema 1 on the first Wednesday and Thursday of the month at Uptown Theatre which is located at 55 Dunlop Street West, Barrie. Your membership card is your ticket. For your convenience, your membership card has a square QR code that can be scanned at the door before entering the theatre. Pass holders may attend a single Screen One Film Series screening per month (times vary over two days of screenings). There are many seats in the theatre but the Barrie Film Festival cannot guarantee seating availability, so please arrive early if you want a good seat. 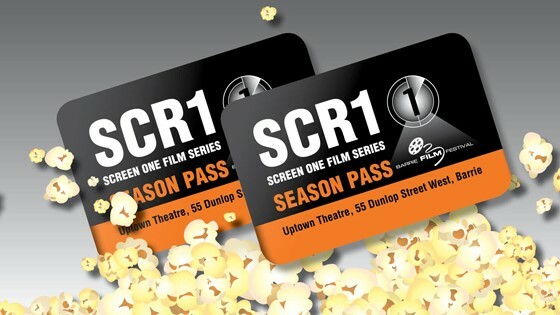 This pass is solely good for the Screen One Film Series and not for use with other series or festival screenings. The Screen One Film Series is a project of the Barrie Film Festival. Thank you for supporting this program and we hope you enjoy the film selections.